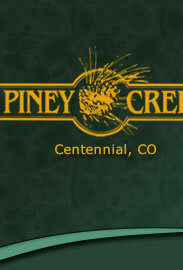 Piney Creek is located in the city of Centennial, CO. The boundaries of Piney Creek are the City of Aurora line just north of The Hilltop on the North, E. Orchard Rd. on the South, Buckley Rd. on the East and includes the Glen subdivision on the West. Expansive views of the Front Range and a commitment to excellence in planning and construction are not the only elements that make Piney Creek a distinctive community. Located within the highly acclaimed Cherry Creek School System and adjacent to Cherry Creek Reservoir, a Colorado State Park and one of Colorado's finest water-oriented recreation areas, Piney Creek also boasts rapid access to Denver International Airport, and major business centers such as the Denver Tech Center, and Inverness Business Park. 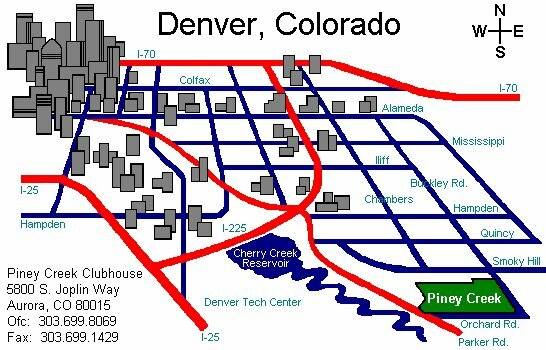 Even the central business district and the cultural amentities of metropolitan Denver are no more than a quick 30 minute drive from your home!